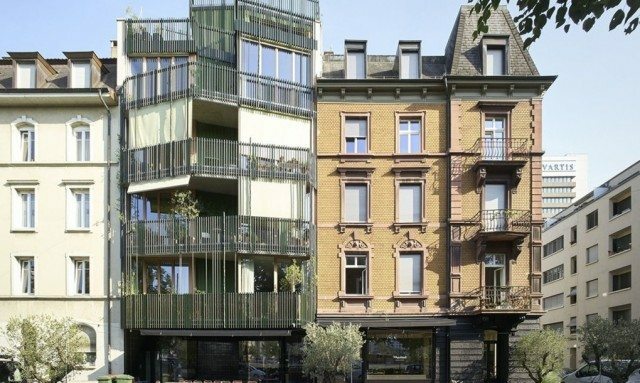 Swiss architects rejuvenated a residential block with some structural upgrades—and it's a blueprint for cities everywhere. Toronto is perpetually caught between progress and history. We’re a growing city, trying to build more and bigger condo towers, and new and shinier office blocks, without sacrificing our architectural heritage. It’s a bind we share with plenty of other cities around the world. Some, like Rome, address it by imposing hardline height restrictions on new buildings. Paris protects certain neighbourhoods from developers by retaining the right of first refusal when properties there go up for sale. But architects in Basel, Switzerland have achieved the most literal compromise between old and new. A local firm has revitalized three historical homes in the city’s industrial and residential St. Johann neighbourhood by wedging one new one between them. On a parcel of land at the corner of Lichstrasse and Kraftstrasse were four houses—old five-storey residences in need of revitalizing. The designers rebuilt one and built new stairs and an elevator into the shared courtyard. The result is three old buildings saved from the wrecking ball and turned, instead, into viable real estate commodities. Like the cuckoo clock (a Swiss icon, despite being German, it turns out), it’s a modern insertion that makes a quaint outer shell useful. It’s a tantalizing concept for cities like Toronto. Because, as we have seen with the likes of Stollery’s menswear store and the McLaughlin Planetarium, there are plenty of cherished old buildings demolished in spite of how beloved they are. Historical value is subjective. Further proof of that can be found at the Guild Park and Gardens just along the shore from the Scarborough Bluffs. There, on the old grounds of a long-gone estate-turned-artists’ colony-turned-hotel are over 70 bits and pieces—facades mostly—of the buildings that made up pre-World War II Toronto. They are the death masks of the structures that stood where now we have the glass and steel financial district, the concrete law firms and ad agencies and plastic fast food joints. They are a beautiful and haunting reminder that our urban landscape was once a lot more neoclassical and gothic revival and art deco. Maple Leaf Gardens, by submitting to a partial update, got a happier ending. Likewise, the Honest Ed’s redevelopment plan pledges, at least, to make “heritage retention” a “focal point.” And, as cringe-inducing as it was to hear Old City Hall spoken of as the site of a future mall, it was far better than the prospect of no Old City Hall at all. So, developers, heritage-lovers, get compromising. We have the capacity to move forward while still looking backwards. It might just take a bit of architectural imagination.